We can make PDF output files from Sapir Shulchanit files! Send them straight to the printer, without making plates!! New material for full text search. 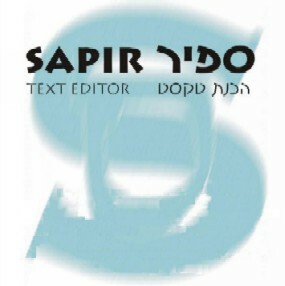 Sapir is a low cost, lighweight Hebrew/English text processor that has many special features for producing written Torah material. Sapir now includes full support for Palm files. Smoothly move from PC to Palm and back. Integrated text search - find your references without leaving the program. Trial version has Tanach; full version has Tanach, Bavli, Yerushalmi, Tosefta and Rambam Mishneh Torah. You can use Sapir to prepare text that will be formatted and printed in another program such as Microsoft Word, or submitted to a newspaper or periodical, etc. See below for information on Integrated Text Search and Sheim Hashem protection, new features in version 3.55 from March, '04. It can import and export (with its Text Conversion Wizard) from many DOS and Windows formats, and has many utilities including Super Find which can do up to 1500 transformations in one pass. Sapir works on any version of 32 bit Windows. It does not require Hebrew support. A partial list of its advanced features: multiple document interface, virtually unlimited file size, integrated Super Find/Replace, Conversion Wizard (DOS -> Windows; Windows -> DOS; various formats: RTF; Windows CP1255; Sapir DOS; QTEXT, Einstein, 3B2), MRU list, Favorites list, Undo/Redo, Advanced Editing Commands, Phonetic keyboard for English-speaking users, and more. To visit the Tips and Additions page click here. To see a Screen Shot click here. Palm OS Support. Sapir includes full Palm OS support, for any computer that uses the Palm OS (operating system). One click on the popup menu prepares the file for sending to your handheld at the next Hotsync. One click checks for updates from the Palm to your PC. 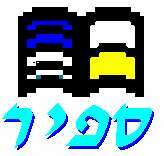 Prepare English and Hebrew files for distribution on Palm computers. Sapir produces standard PDB files readable in all Palm readers. Also read Palm PDB files on your PC with Sapir. To Register click here to email your User Key You will receive your registration key by return email.